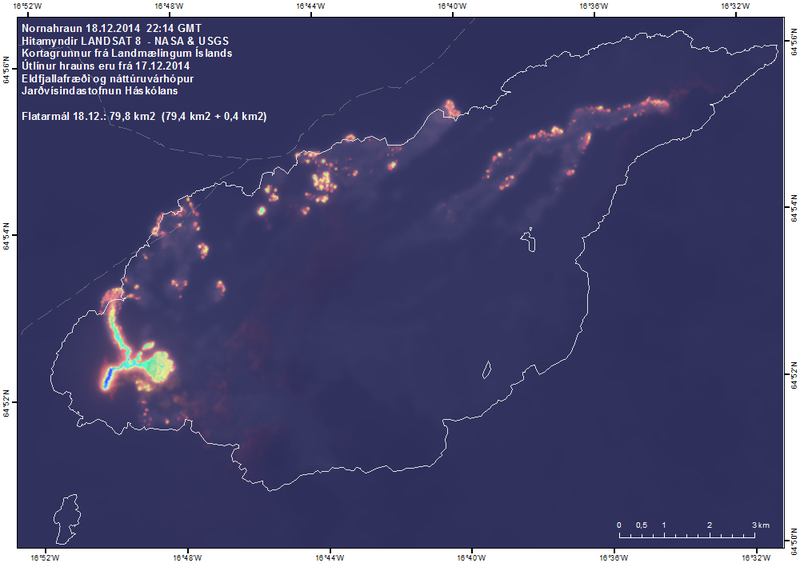 This is a short update of Bárðarbunga volcano eruption. The eruption has now lasted almost four months. Making this the longest eruption in Iceland for many, many years. This might be the longest eruption in Iceland since 19th century. The lava field in Holuhraun is now larger then 80 km² in size. The lava now flows underground in lava tubes inside the lava field. It breaks out on the edges at times and sometimes up on the surface. Earthquake activity remains the same in Bárðarbunga volcano. Bad weather has decreased the sensitivity on the nearby SIL sensors. Some remain offline due the weather and heavy snow in the area. Subsidence has slowed, the amount of larger earthquakes has also dropped at the same time. It has not stopped, just slowed down for the moment. There are no signs about the eruption ending any time soon. The eruption could go on for years, at least many months in it’s current phase. Scientists are getting bored of the meetings about the Bárðarbunga volcano. So far around 80 or so meetings have taken place since the eruption started. Scientists are going to continue monitoring and keeping going to meetings, even if they are a bit bored on them. Police is keep watch in Drekagil location. At the moment there are just two police people at that location now. Since no scientists have been able to go to Holuhraun in the past two or three weeks due to bad weather. Latest news report suggest that dyke intrusion is taking place in Tungafellsjökull volcano. 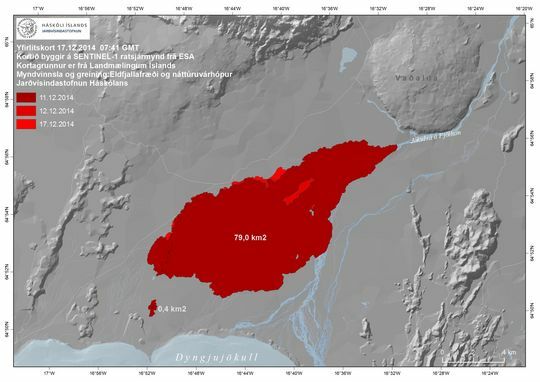 If an eruption takes place in Tungafellsjökull volcano it is guessed that is not going to be any larger than the eruption in Fimmvörðuháls in Eyjafjallajökull volcano during it’s eruption phase in 2010. Earthquake activity is expected to continue in Tungafellsjökull volcano while Bárðarbunga volcano is active. Earthquake activity in Bárðarbunga volcano and Tungafellsjökull volcano for the last 48 hours. Copyright of this image belongs to Icelandic Met Office. Other than this there is nothing else to report at the moment. Next updates about current phase of the eruption in Bárðarbunga volcano are going to be on 27-December-2014 and 29-December-2014. I have made the decision on moving my Paypal to Iceland. Since I won’t be moving back to Denmark and there is no point in keeping my Paypal account in that country. I am going to move the PayPal account tomorrow (23-December-2014) once everything has clear from it. This means that there won’t be any donation button for the next few days while I move it to Iceland. Since it takes few days to get validated by PayPal. It is going to be possible to donate directly to my Danish bank account until I close it down late 2015 or early 2016. More details are going to be posted on that later. Article updated on 11:51 UTC on 23-December-2014. This entry was posted in Bárðarbunga, Caldera, Dyke intrusions, Earthquakes, Eruptions, Fissures, Gas, GPS data, GPS Monitoring, Harmonic tremors, Lava, Magma, Monitoring, Swarm, Tungnafellsjökull, Volcano. Bookmark the permalink. Thanks for the update Jon. If tungafell erupts, will that have any effect on BB and if so how is it likely to effect it. None, this time Bárðarbunga volcano is having effect on Tungafellsjökull volcano (it seems). Where can I read more on the possible dyke intrusion in Tungafell? So far I just found a mention about this in news on Vísir.is. I’m not sure if anything more has been published so far. Here’s a bit older (2013) research paper on Tungna with some detailed description and amazing photos. After reading that, the possibility of a minor intrusion of local origins is not surprising. Who knows, Bardarbunga could decide to make use of those dikes for something bigger. Thanks for posting the link, Steve. Off topic, something is happening in Italy, just out side Florence. There has been a large EQ swarm in the last few hours. Largest EQ has been 4.3 with several more 5+s loads of 3s and hundreds of 2s. There also seems to be an increase over all in EQs throughout Italy in the last 24 hrs. I think you should have a look around other sites for the full picture. The quakes are taking place aprox 20 km south of Florence, and thE EMSC site lists 153 mag 1 and above in the last 24 hrs. Volcano discovery list 147 2.2 + in the last 4 days including several high 3s and low 4 a today. The site you gave seems to list very few of the EQs that have occurred in the last few days. The app I have on the phone “Europe Alert” lists 41 in the last 8 hrs. With over three quarters of them confirmed on other web sites. Please note that I decided to update my bank information for those how want to donate directly. It is now connected to my Icelandic account, not my Danish account. What is the risk of a major caldera collapse, and if such collapse occurs, what is the risk of an explosive event of collosal (VEI-6), or mega-collosal (VEI-7) in size? Is not a caldera collapse in regards to a huge eruption, the result of the eruption emptying the chamber,rather than a huge eruption from an initial collapse?If the magma under the caldera is like the basalt erupted at Holuhraun then there would only be explosive eruptions similar to 2010 and 2011?For there to be a VEI 6 there would have to be a large deposit of eruptible rhyolite or similar in play,that the subsiding caldera would decompress?The more knowledgeable here will be able to give a better answer than me,this is just what I think. Old Paypal account closed (Denmark) and new one opened up (Iceland). There are minor changes that now happen (I knew about those). Paypal charges $5,00 for the transfer of money to my pre-paid credit card, since they don’t offer any direct to bank transfer in Iceland. I just didn’t want to use Denmark any more since I am closing everything down there (since I won’t be moving back to Denmark). It is going to take up to 1.5 year until I have finished closing everything down. Thank you J.B. Things seem clearer to me now. I now realized that what is subsiding is only the ice which probably covers a solid rock roof over the magma chamber, that is why flooding is the only concern? I also understand that if the magma is not of an explosive type, then possibility of explosive events is very remote? There would be potentially explosive events if basalt was to meet with glacial ice/meltwater,but I would doubt that there would be a Krakatoa size event from that interaction as the onset would be quite gradual.If a highly viscous magma,such as rhyolite or dacite was involved and it contained a lot of H2O in solution,then that is what would potentially give the very explosive type of event leading to the ejection of many cubic kilometers of material.There are a lot of ” ifs” in that scenario.Is there any viscous magma in the caldera?is it present in sufficient quantity?Is it in a gas charged eruptible state? It’s not just the ice subsiding. The caldera floor has subsided somewhere around 50 mts at the last scans. There might be some subsidence of the ice but I don’t think that has been confirmed. Wish they’d publish another updated pic of the lava flow with the streamlets of the river showing. Thanks. But that’s still not very clear re the streamlets and topography. Huge amount of information on the IMO site. (Thanks!) Take a scroll down this page. Looks like quake activity in Bardarbunga as well as the fissure is increasing again, multiple clusters over the last couple of days. Is it possible that the rifting may proceed even further to the northeast? Especially the quakes northeast of Askja are quite interesting.